Sarajevo-Guide.com and its affiliates offer this web site to you, the customer, conditioned on your acceptance without modification of the terms, conditions, and notices contained herein. Your use of this web site constitutes your agreement to all such terms, conditions, and notices. SARAJEVO-GUIDE.COM AND/OR ITS RESPECTIVE SUPPLIERS MAY MAKE IMPROVEMENTS AND/OR CHANGES IN THIS WEB SITE AT ANY TIME. THE INFORMATION MAINTAINED ON THIS WEB SITE COMES FROM MANY DIFFERENT SOURCES. WHILE SARAJEVO-GUIDE.COM MAKES EVERY EFFORT TO INSURE THAT THE INFORMATION IS ACCURATE AND UP-TO-DATE, SARAJEVO-GUIDE.COM ASSUMES NO LIABILITY FOR ANY ERRORS OR OMISSIONS. SARAJEVO-GUIDE.COM, ITS AFFILIATES, AND/OR THEIR RESPECTIVE SUPPLIERS MAKE NO REPRESENTATIONS ABOUT THE SUITABILITY OF THE INFORMATION, PRODUCTS, AND SERVICES CONTAINED ON THIS WEB SITE FOR ANY PURPOSE. ALL SUCH INFORMATION, PRODUCTS, AND SERVICES ARE PROVIDED "AS IS" OR "AS AVAILABLE" WITHOUT WARRANTY OF ANY KIND. SARAJEVO-GUIDE.COM, ITS AFFILIATES, AND/OR THEIR RESPECTIVE SUPPLIERS HEREBY DISCLAIM ALL WARRANTIES AND CONDITIONS WITH REGARD TO SUCH INFORMATION, PRODUCTS, AND SERVICES, INCLUDING ALL IMPLIED WARRANTIES AND CONDITIONS OF MERCHANTABILITY, FITNESS FOR A PARTICULAR PURPOSE, TITLE, AND NONINFRINGEMENT. IN NO EVENT SHALL SARAJEVO-GUIDE.COM, ITS AFFILIATES, AND/OR THEIR SUPPLIERS BE LIABLE FOR ANY DIRECT, INDIRECT, PUNITIVE, INCIDENTAL, SPECIAL, OR CONSEQUENTIAL DAMAGES ARISING OUT OF OR IN ANY WAY CONNECTED WITH THE USE OF THIS WEB SITE OR WITH THE DELAY OR INABILITY TO USE THIS WEB SITE, OR FOR ANY INFORMATION, PRODUCTS, AND SERVICES OBTAINED THROUGH THIS WEB SITE, OR OTHERWISE ARISING OUT OF THE USE OF THIS WEB SITE, WHETHER BASED ON CONTRACT, TORT, STRICT LIABILITY OR OTHERWISE, EVEN IF SARAJEVO-GUIDE.COM, ITS AFFILIATES OR ANY OF THEIR SUPPLIERS HAS BEEN ADVISED OF THE POSSIBILITY OF DAMAGES. SOME OF THE ACTIVITIES DESCRIBED ON THIS WEB SITE COULD BE INHERENTLY DANGEROUS. YOU ARE RESPONSIBLE FOR USING YOUR OWN JUDGMENT IN UTILIZING THE INFORMATION IN A SAFE AND PRUDENT MANNER. NEITHER SARAJEVO-GUIDE.COM AND ITS AFFILIATES NOR OTHERS WHO SUPPLY INFORMATION CAN BE HELD LIABLE FOR ANY INJURY THAT MAY RESULT FROM THE PURSUIT OF ANY ACTIVITIES DISCUSSED ON THIS WEB SITE. This web site may contain hyperlinks to web sites operated by parties other than Sarajevo-Guide.com. Such hyperlinks are provided for your reference only. Sarajevo-Guide.com does not control such web sites and is not responsible for their contents. Sarajevo-Guide.com's inclusion of hyperlinks to such web sites does not imply any endorsement of the material on such web sites or any association with their operators. In order to book or arrange service for you Sarajevo-Guide.com may ask you for deposit payment in order to ensure service availability and/or for reimbursment of service provided. However, it could happen that for reasons beyond our control, we have an occasion to cancel your booking. In such cases we will grant you a full refund or offer you an option of an alternative service. You acknowledge that by cancellation of booking Sarajevo-Guide.com will not be held responsible for any incurred damages. The remainder of the payment owing to the service arranged, (which is the total minus deposit payment, plus any incurred bank charges, and additional fees) will be ragulated on the spot, meaning with the start of the service to the service provider or to the Sarajevo-Guide.com representative. You acknowledge that Sarajevo-Guide.com in presenting certain services acts only as an intermediatery party and has no responsibility whatsover on the way in which service is arranged or offered. You will not hold Sarajevo-Guide.com liable for any damage incurred from use of those services. Sarajevo-Guide.com may arrange certain services for you acting on your behalf. You acknowledge that Sarajevo-Guide.com will be entitled to a fee and/or processing fee regarding those services and will not be held responsible for any damages incurred from use of those services. Separate terms and conditions will apply to any transaction between you and third-party suppliers of Sarajevo-Guide.com You agree to abide by the terms or conditions imposed by any supplier with whom you elect to deal, including, but not limited to, payment of all amounts when due and compliance with all rules and restrictions regarding availability of fares, products, or services. All details supplied to Sarajevo-Guide.com will be maintained confidential, and not sold or distributed to third parties except in cases where it is essential to provide such information to third parties in order to provide the service requested. You agree that no joint venture, partnership, employment, or agency relationship exists between you and Sarajevo-Guide.com as a result of this agreement or use of this web site. This agreement constitutes the entire agreement between the customer and Sarajevo-Guide.com with respect to this web site and it supersedes all prior or contemporaneous communications and proposals, whether electronic, oral, or written, between the customer and Sarajevo-Guide.com, with respect to this web site. 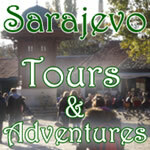 All content of Sarajevo-Guide.com is subject to copyright either to Sarajevo-Guide.com, its affiliates, or suppliers. Sarajevo-Guide.com reserves the right to change the terms, conditions, and notices under which this web site is offered.